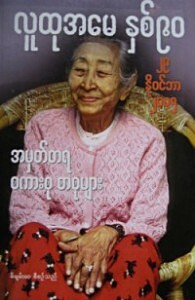 On April 7, 2008, a sad news was published: Ludu Do Ama, the famous journalist from Mandalay, Burma, died at the age of 93. Her family and friends in Mandalay and all over Burma and also many Burmese exiles in Thailand, India, Europe and America, as well as friends of Burma all over the world, who always had great respect for her, are mourning.In the title of the book, published in Burmese at the occasion of her 90th birthday, she was called Ludu Amei, which means Mother of the People. Her whole life and her work may be considered a mirror of the Burmese people´s struggle for a better future. During the British colonial period, in the thirties of the 20 th century, she was a student of the Mandalay and later Rangoon University where in 1936 she took part in the students´ strike against the British education. During the Second World War she joined the struggle against the Japanese invaders. In 1948 Burma gained independence and soon after the Burmese government imprisoned her husband, Ludu U Hla. At that time Do Ama, apart from taking care of the whole family, took over all his responsibilities and carried on publishing Ludu newspaper. And when in 1958-60 and in 1962 the military junta under general Ne Win took over the power, she always sided with people who opposed the regime and fought against its oppression. And even in autumn last year she, in her 92 years, was brave enough to stand on the side of the Burmese Buddhist monks and people , protesting against the junta¨s cruelties. The Ludu Publishing House in Mandalay was always a centre of young poets, writers and artists of Upper Burma, who tried to establish modern Burmese language, literature and art against the old-fashioned traditional authors. The language of Do Ama, who always respected Burmese tradition, was beautiful, clear and modern. Apart from articles in the newspapers and journals she published short stories, biografies of Burmese writers, dramatists, actors, painters, books on traditional music, history of Mandalay etc. In this way she managed to preserve evidence of Burmese tradition, culture, old fotographs and documents. She also translated world literature into Burmese. Do Ama was always a great friend of Czechoslovakia, which she visited in 1962. When in 1958-60 we, two Czech state scholars studied at the Rangoon University, she was always helpful and gave here advice. During the holidays she invited us to Mandalay and Upper Burma and told us which pagodas, monuments and other interesting places to visit. At that time here eldest son, Ko Soe Win, was our guide. She herself took us to Meimyo and helped us to organize our trips to the Shan and Kachin States.We almost felt to be part of her family, being added to her five children. She took care of us as our Burmese mother. And during our next visits to Burma she used to introduce us to outstanding personalities of the Burmese life of culture, being a person who was always ready to give us help. Her passing away is a painful loss not only for the Burmese people bur also for Burmese scholars from other countries, who were in contact with her. Let us hope that in future her place will be taken over by the younger generation – her youngest son Ko Nyein Chan (writer Nyi Pule) and many others.